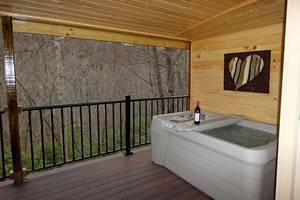 Gatlinburg Cabin Rentals, private cabin for two featuring huge red heart shaped jacuzzi, huge outdoor hot tub, king bed nestled on our beautiful and secluded private mountain top - fully equipped kitchen, fireplace, Free Wi-Fi, TV with DVD Player, private deck overlooking wooded view. 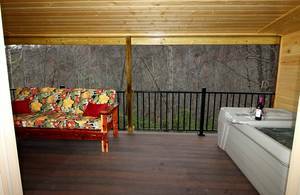 Exclusively for couples, anniversary, birthday, special getaway, Gatlinburg honeymoon hideaway or Gatlinburg honeymoon cabin rental. Not well suited for children or families. Maximum Occupancy: 2. No pets, no smoking. We chose to stay in the cabin Lovin' Inn to celebrate our 6 year anniversary. We were pleasantly surprised at how courteous the staff was at Honeymoon Hills. We were impressed with the cleanliness of the cabin. We thoroughly enjoyed our stay. The location of the cabin was very convenient. We would like to thank Honeymoon Hills for being so accommodating for our special occasion. Thank you for a great stay. The cabin was nice, felt very secluded and had an updated kitchen. We will definitely return. I fell in love with our cabin, Lovin' Inn. I would give it two thumbs up! I will definitely be back. My husband and I were married and spent our honeymoon in the Lovin' Inn cabin. 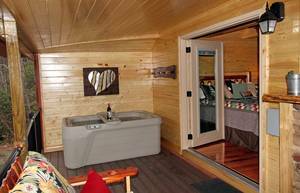 We were very impressed and pleased then and decided to return to Honeymoon Hills to stay in the same cabin for our anniversary. The area is beautiful, quiet and well maintained. It is perfectly located and convenient to the local attractions. We enjoyed visiting the arts and craft shops in the Glades as well as catching a few shows in Pigeon Forge. We were really surprised with the free tickets provided by Honeymoon Hills. We saved a lot of money on admissions to several shows and attractions. We definitely recommend the Titanic, Magic Beyond Belief and the Hatfield and McCoy Dinner Show. Thank you for making our stay the best in Gatlinburg, Tn. Hills in November with them! The staff, especially Jeannie is spectacular! Always so friendly and more than accommodating to any questions I have. 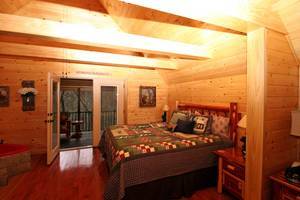 I must say on each stay the cabins are very clean and well equipped! The staff is truly educated in the standard of southern hospitality! We went to HONEYMOON HILLS for our anniversary. First time to Gatlinburg for years and already want to go back. 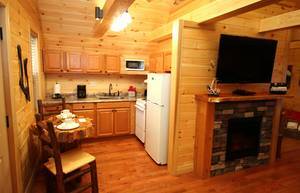 The cabins are just 5 minutes away from all the stores and attractions on the main parkway. This makes it easy to go back and forth. Once we were at our cabin, you would never know the town was there. It's hidden away on the hillside, all you see are the trees and mountain views. 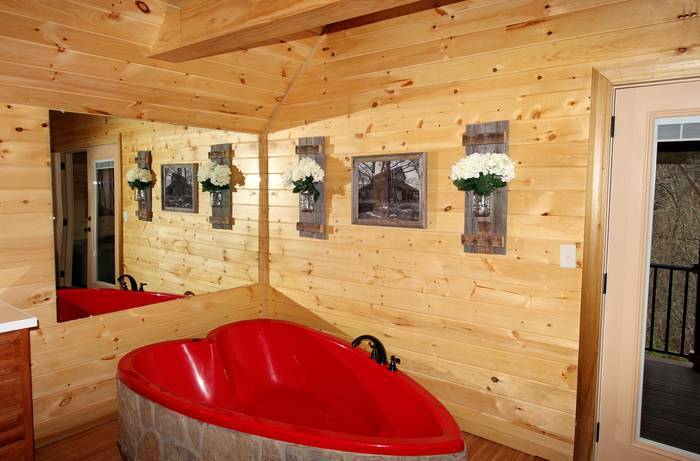 It's quiet, cozy and just for couples. 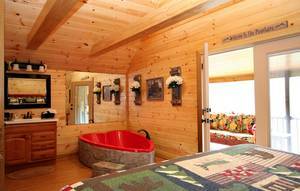 All the decorations, the heart shape jacuzzis and fireplaces sets it all off for someone wanting a romantic getaway for just the two of you. HONEYMOON HILLS is the place to go for value and cleaniness. It was far better than just a hotel room especially if its a wedding anniversary or honeymoon. The trolly stops just down the hill from the cabins if you don't want to do drive. Only stayed for two nights but it was one of the best and most memorable trips we have ever taken. Our cabin was perfect! Thanks again, we will be back. It was our first time to get away for Christmas. Our cabin was really sweet and romantic. We enjoyed the shopping, the mountains and our cabin very much. It was very enjoyable to leave our everyday lives and have it be about just the two of us for a few days. 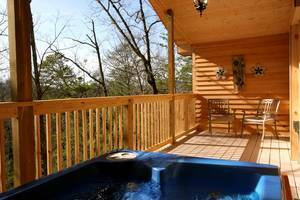 We will be back to Honeymoon Hills & Gatlinburg, TN. Our decision to make reservations was last minute! Your staff was most helpful, friendly, courteous and knowledgable. Our wedding ceremony at the Chapel at Honeymoon Hills was perfect for us! We couldn't have planned it better ourselves. The cabin, Lovin' Inn, was excellent and clean! We loved the table setting! We loved the seclusion and privacy. No one bothered us. Great location. Join Facebook, I tagged your location. Our friends are looking at your website. We will be back soon, thank you! To be honest I don't know where to start! Honeymoon Hills was simply amazing! When I called to reserve a cabin, the reservationist was very helpful and very respectful. The actual cabin itself was tremendous. The only mistake I made was not coming here sooner! I stayed at Lovin Inn and it was awesome. It was very clean and had a huge heart jacuzzi. Among great things about Honeymoon Hills is it's close to everything and we never ran out of stuff to do. My wife and I will definitely be back soon! 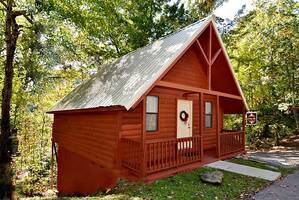 Honeymoon Hills is a quaint romantic get-a-way with cabins that provide exceptional privacy, nice facilities, and great service. All this & affordable! 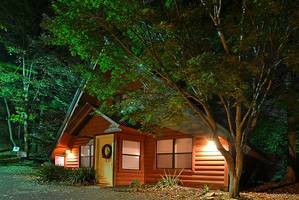 Upon arrival to our cabin at Honeymoon Hills we automatically felt the cozy yet romantic vibe. 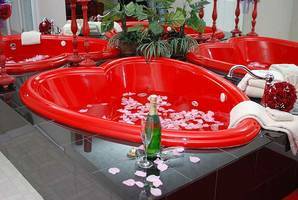 The bed, fireplace, and red heart-shaped jacuzzi made our honeymoon a very special time that was unforgettable. This was our first but definitely not our last time to the City of Gatlinburg. Thank you for a wonderful honeymoon! We have been married 30 years and never had a honeymoon. This was our delayed honeymoon! We really enjoyed the cabin and the privacy. I'm glad we came to Honeymoon Hills in the Smoky Mountains, we had a vacation we will never forget. We stayed at Honeymoon Hills for our honeymoon and had the best experience of our lives. We loved everything the minute we walked through the door! This wasn't just a vacation...this felt like a honeymoon because of how loving the atmosphere was. The cabin was perfect for two people. There was plenty of room and very cozy. We would love to stay here for every vacation in the future. Thanks Honeymoon Hills for the best honeymoon at the best price in town for what you get! We really enjoyed our trip to Gatlinburg. 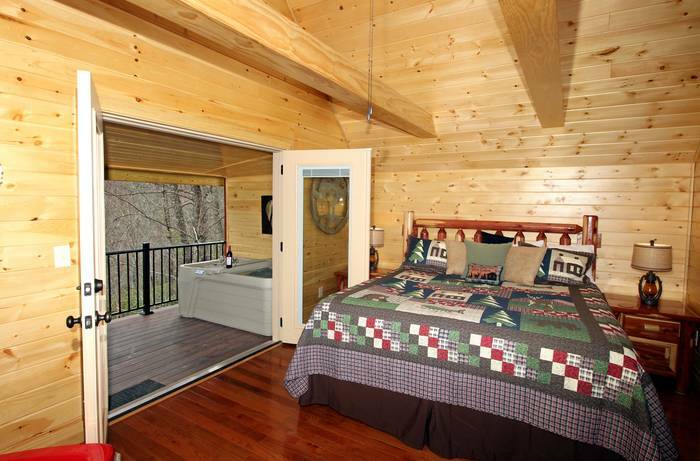 When we decided to come to the Smokies for our honeymoon we wanted the perfect cabin. We were referred by friends that Honeymoon Hills was a great place to stay. I called right away. The lady on the phone was super nice and helpful. We immediately booked our cabin as the rate was great! We arrive after a long day and the cabin was PERFECT, just what we wanted. We will also definitely recommend Honeymoon Hills to anyone! We came here for our 30th Anniversary. Honeymoon Hills more than lived up to our expectations. Our cabin, Lovin' Inn, was cozy and comfortable. It had everything we needed. We loved the jacuzzi and fireplace. 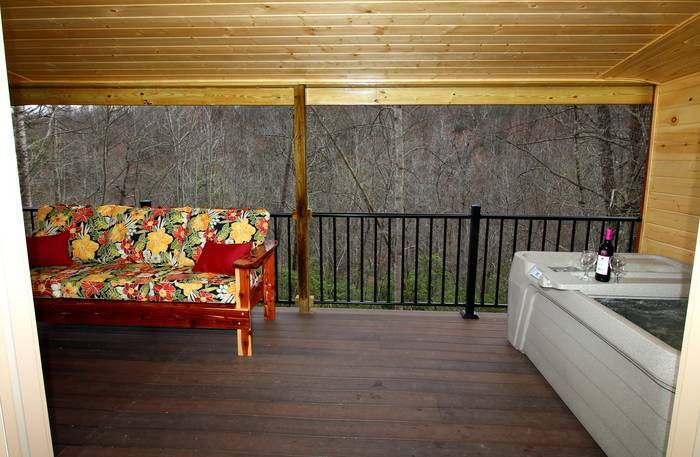 Our cabin was far enough out to feel secluded but close enough to Gatlinburg to enjoy the sights. We will highly recommend Honeymoon Hills to our friends and co-workers. Thanks for making our first visit so enjoyable. 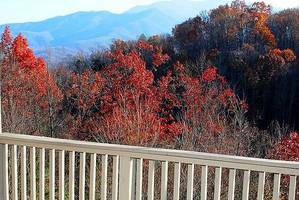 November is one of the best times to enjoy the beautiful scenery of the Smoky Mountains. All the colors were changing, not too crowded, nice brisk weather, just to mention a few. The cabin is well maintained with everything you need is right there. Great place for a romantic getaway! All we could say was wow! For 28 years now we’ve been celebrating our wedding anniversary but never in a private secluded cabin that’s so close to all the attractions. 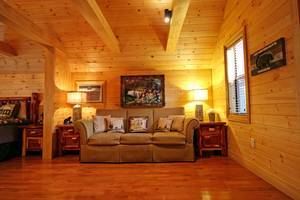 The cabin was in an unbelievable setting that gave the feel of a home as opposed to a commercial hotel room. 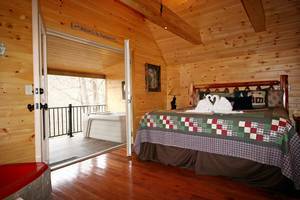 Over 28 years we have vacationed many nights in many motel rooms and resorts from Charleston, Myrtle Beach, New York City, Las Vegas, etc but none compared to our cabin at Honeymoon Hills. The Lovin’ Inn cabin, all we could say was wow. My wife and I stayed at Lovin’ Inn to celebrate our 9th wedding anniversary. It seems that after years of being together and in love sometimes we forget to keep the romance going. We are still as in love as we have ever been but with four small children it is hard to make time for each other. 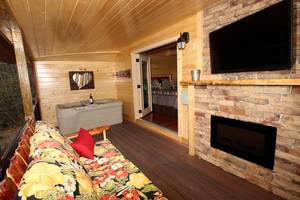 Lovin’ Inn was the perfect honeymoon cabin to help us capture and rekindle that romance. 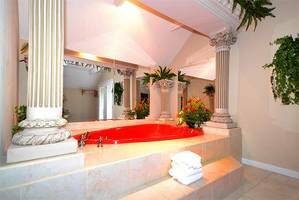 From the romantic décor to the heart shaped jacuzzi tub, everything was catered to romance. Our favorite part of the cabin was the lighted canopy bed. It seemed to just add an extra touch. The bed was not only beautiful, it was the most comfortable mattress either of us had ever slept on. This was the perfect cabin for our romantic, stress free time away with my beautiful love of 9 years. This was our first trip to Honeymoon Hills but will definitely won’t be our last. We have decided to make this a yearly trip. We cannot wait to come back. Honeymoon Hills gets us! 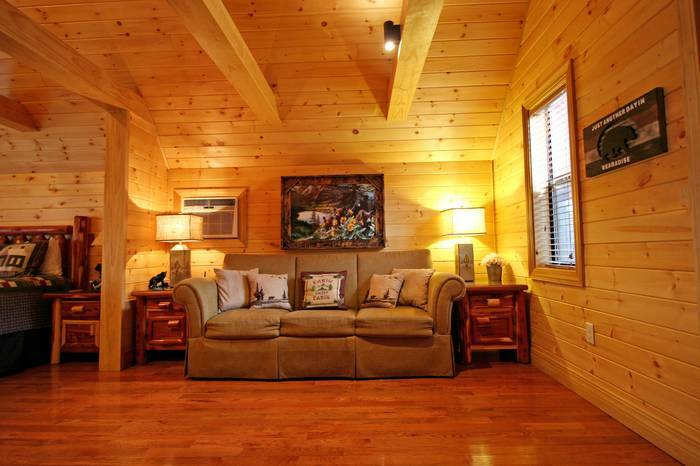 Our cabin was very quiet, relaxing with a great setting. No hassles checking in or out. They were awesome about respecting our privacy. Our cabin was very clean and wonderfully serene. We plan on celebrating our anniversary next year and for many more to come. I would strongly recommend staying at Honeymoon Hills to anyone who is planning a romantic getaway or honeymoon. We celebrated our 29th Anniversary. Gatlinburg is one of the most beautiful places. We love to come and visit. 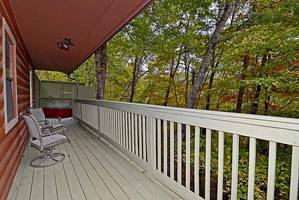 We love coming in the fall because of our anniversary that we celebrate and look forward to the beautiful fall foliage. God created the mountain for all to enjoy! The Lovin’ Inn cabin was a joy to stay. Everything was very clean, set-up for a romantic getaway and the scenery especially from our deck was so beautiful and relaxing. Thank you for an enjoyable visit! We came for our wedding and honeymoon. The cabin was very clean and comfortable. 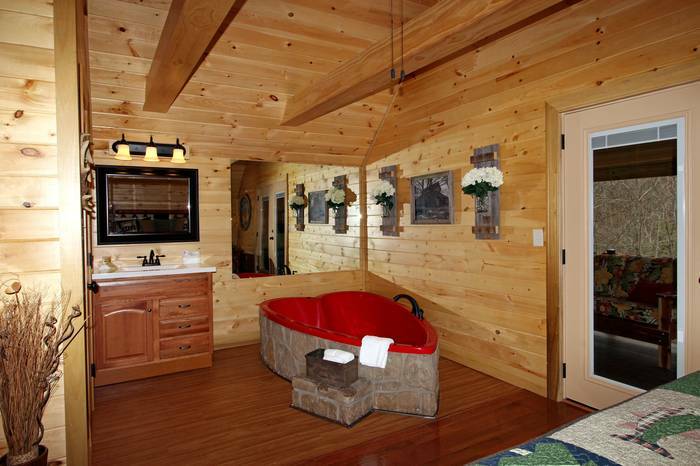 Love the heart shaped tub. We enjoyed it very much. At our wedding ceremony everyone was very friendly. I was extremely nervous but everyone put me at ease. Our ceremony was perfect. The photos were beautiful. They were very helpful with everything. Overall we had a wonderful time. Thank you very much. This was my fiancée and my first trip to Gatlinburg. From the moment we reached the city we fell in love. Our cabin, Lovin’ Inn however was the icing on the cake. It was so peaceful and romantic. We came here to celebrate his birthday and we definitely had a great time. We visited Ripley’s Odditorium, Ripley’s Aquarium, Moving Theatre, but our favorite would have to be Ripley’s Aquarium. Thank you for the hospitality. We look forward to returning. Our wedding and honeymoon was everything that we expected. The wedding was fabulous. The Preacher and photographer were great. The are both really down to earth and great people. This was very quiet retreat for any honeymoon or anniversary couple. 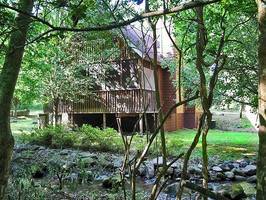 The cabin is as secluded as we had wished it would be, beautiful and very nice. The rose petals were great welcoming us. Thank you for the best wedding and honeymoon ever. It was everything I could dream of. Gatlinburg is very pretty this time of year. We loved all the Christmas lights and decor. It was great to get to come back to our cabin and relax after a long day of fun. It is very quiet up there and you can easily escape from the hussle of town. I will recommend it to all our friends and family. It is so easy to schedule and very hassle free. We really like the ease of making the reservations. Also they had everything done for our wedding just we way we wanted it. Great place to vacation and/or get married. This was our first time staying at Honeymoon Hills and we LOVED IT! It has been the best place we have ever stayed in Gatlinburg. We have never felt more at home or safe as we did here. This place has brought us closer as a couple and it is exactly what we needed. The view from our back deck was breathtaking and we have so many pictures to take back with us. 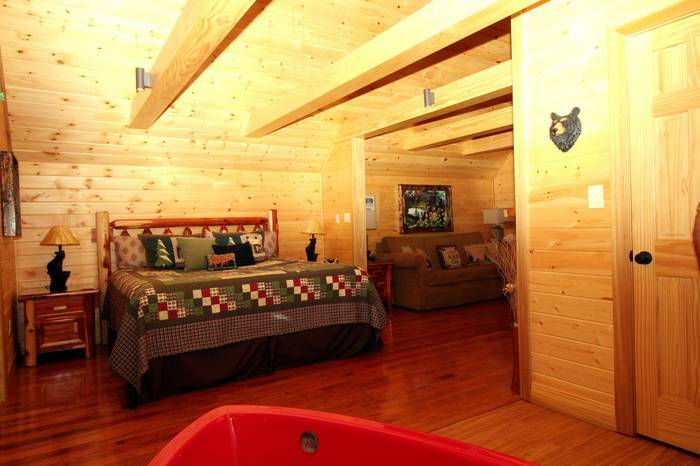 The cabin was so nice and clean. We just knew we picked the right place, not to mention the beautiful bed was so comfy. We slept like a baby! We definitely will be staying here again really soon and are going to recommend it to all our friends and family. P. S. We lived in the heart shaped jacuzzi!! We loved the Lovin Inn and the staff was excellent & very helpful! We had the best time! This was my husband's 50th birthday. We were married 22 years. We've been together 26 years. This was a great way to reconnect with the one you love! This was so relaxing and quiet, the best trip--just wished we didn't have to go back to reality but you have to see the grandkids! I'll always remember our time at Honeymoon Hills and pass it on to the next person! My husband & I stayed at Lovin' Inn. It was so relaxing, cozy, and just felt like home. We both thought it was very romantic and private. It's just a cute little nest for honeymooners or just a couple to getaway from work, stress, kids, etc. It was just fun, no a better word--fabulous! Hands down, this was the best idea for us as a couple to rekindle that flame that seems to get lost in everyday routines. Our cabin was perfectly tucked into the beautiful mountains and was so cozy we didn't want our time to end. We plan to revisit soon because our time here was beyond any expectation we had. If you enjoy your stay as much as we did, you're sure to fall in love all over again! We thoroughly enjoyed our stay at Honeymoon Hills. Our wedding ceremony was very simple and beautiful. The Minister did a beautiful dignified service for both of us. As Christians, his service meant so much to us. This was a third wedding for both Wade and I but was the most touching and heart-warming. Titania was really great, warm and welcoming. As I said, this experience was fabulous and we will return! Excellent service, very nice and quiet place to stay. The jacuzzi was awesome!! This was our honeymoon trip. My husband Edward and I enjoyed our stay and their hospitality. We will be returning in the future. Thank you! Our stay was great. I was very pleased with the cabin. Gatlinburg was a nice experience for both of us. Beautiful views, nice places to shop and dine. We loved the cabin the moment we walked in. We couldn't have chosen a more romantic place. It was quiet and we loved the lighting around the bed but most of all the red jacuzzi for 2. We will always remember our stay here. We plan to return at least once every year. 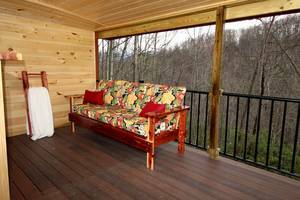 We wish we didn't have to leave with so many activities to do in Pigeon Forge and Gatlinburg! My husband and I came here for our second anniversary. It was our first time visiting Gatlinburg. Our cabin was amazing and simply beautiful. The staff was great! 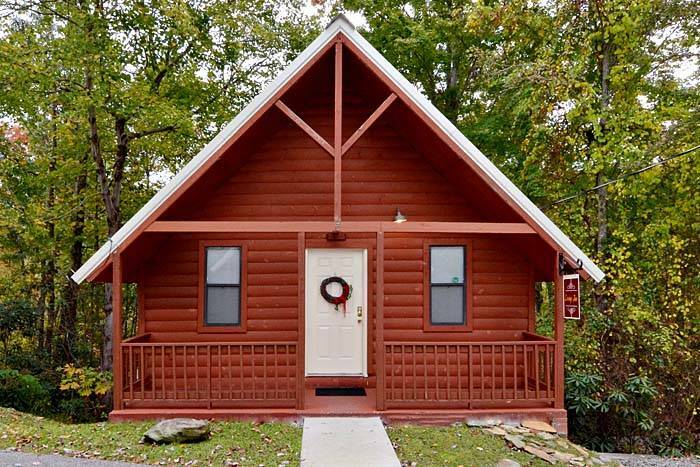 I would recommend this cabin to anyone. The directions were easy to follow. The cabin was beautiful. The design and layout was perfect. This was worth every penny and more. We plan to come here for all our anniversaries! Thank you so much for making our wedding so special and more. The events of planning a wedding with all the details can be extremely stressful for the bride-to-be. I wanted something simple, affordable yet traditional and elegant. We explored the offerings of the surrounding chapels in Gatlinburg, but none could compare to what we found at Chapel at Honeymoon Hills. The chapel was in walking distance of our cabin. This was a great convenience! Our cabin was breathtaking! A cozy, romantic home away from home. From the elegant table settings, heart-shaped jacuzzi, lighted lace canopy bed with roses. I couldn't have chosen anywhere better or more affordable to absolutely satisfy our needs and much more. All my anxieties ceased with the wonderful compassionate planners and staff. The views from the beautiful chapel was superb. Our photographers were absolutely superb. Our wedding ceremony was breath-taking from start to finish. Dr. Dan was awesomely comical yet able to still deliver the elegant, sacred ceremony of marriage! All of our needs were met before, during and after the ceremony. We were 110% satisfied with our choice. I will never forget this wonderful experience. The staff assisted in every way possible and made everything enjoyable. Not only did the staff assist and do all the preparations but also told us about great places to visit in Gatlinburg. The cabins and chapel are conveniently located right outside of the main attractions, so it was easy to tour then a quick trip back to the cabin. We were so pleased with everything about Honeymoon Hills and cannot wait to come back for our first anniversary. All thumbs up here from the bride and groom! Our stay in the Lovin' Inn cabin was unprecedented and beyond our expectations as each day passed. My wife and I traveled to Gatlinburg to celebrate our honeymoon after we were married on the white sandy beaches of Florida a few months ago. 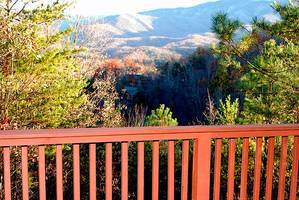 We enjoyed every moment of our stay in Gatlinburg and the surrounding areas. 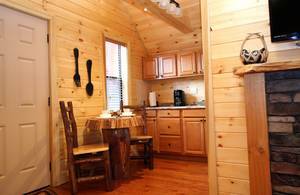 The cabins are in a spectacular location up in the mountains with fantastic view of nature and quite secluded as well. 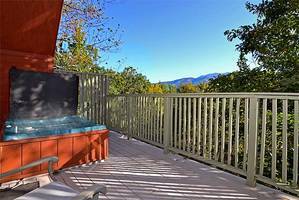 They are only minutes away from all the tourist attractions, hiking trails and the Great Smoky Mountains National Parks. Thank you for the hospitality. We look forward to telling our friends and family about our wonderful trip! Everyone was so nice and helpful. The scenery was beautiful and in the mountains as I hoped for and more. 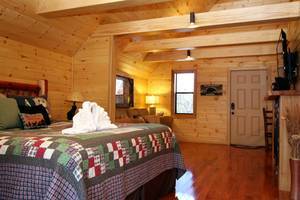 The cabin was the perfect size, comfortable, and very romantic. We were a bit nervous and they were so kind in explaining things and made us feel welcome. I could say so much more about how wonderful it is, but I would like others to experience this as well. I recommend everyone that wants to marry with comfort and beauty to come to Chapel at Honeymoon Hills. We intend to come back every year for our anniversary. We enjoyed all there was to do in Gatlinburg and Pigeon Forge. All the shows and shops were great. Our stay in Lovin’ Inn at Honeymoon Hills was great! Our wedding ceremony at Chapel at Honeymoon Hills was too! Thank you all for what you did for us! The rustic design and cozy atmosphere combined with the close proximity to Gatlinburg, Pigeon Forge and several other attractions created an unforgettable mountain experience. We were given several amenities and other treats from the kind and generous staff. 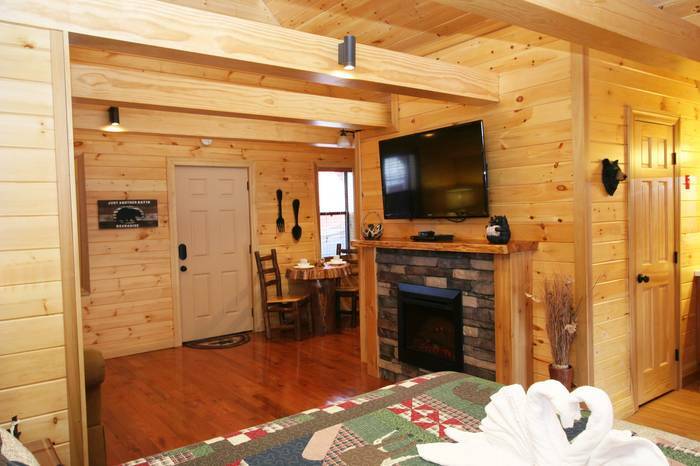 Our cabin was Lovin’ Inn. 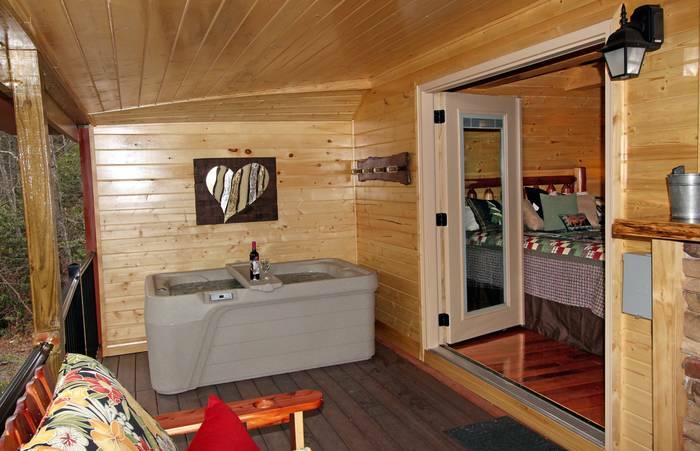 It was just the right size, perfect for two people who needed a romantic place to sleep and make lasting memories. We would recommend this cabin to anyone looking for a romantic getaway! Darrell & I came to Chapel at Honeymoon Hills and were married. We grew up together, went to church together, sang in the youth choir together and became best of friends. My mom taught Darrell in Sunday School and his parents were my friends as well. In high school we dated and fell in love. He was everything to me and we were so close, we even seemed to know what each other were thinking. Like a sad movie in time it seemed like there was a world out there that I might be missing so on a promise of travel and excitement I married someone else. This proved to be the beginning of years of loneliness and heartache. Darrell also married someone who was not at all compatible with his needs or personality. After 20 years of failed effort, we all went our separate ways. The good things from our situations are four wonderful children! The children are indeed a gift and a blessing! After my divorce I lost my mom who was the rock in my life to cancer. Devastated and no longer caring about my own life, I went through each day empty and lost. One Sunday night as my daughter and I sat in church Darrell and his son walked in. I tried to resist my feelings but soon we began talking, then dating and after a few months we found ourselves here in the Chapel sharing marriage vows to each other—the commitment we had felt years ago. We came here the first time to be joined together for a lifetime and to find romance in this beautiful place. It was a storybook wedding and honeymoon—more than I ever dreamed of. We said then that we would come back for our 10th Wedding Anniversary. Darrell is the love of my life. This has been a difficult year in many ways. We both lost our fathers to cancer. Financially it has been a year to just get by the best we could. Working extra and putting everything together we could, we managed to pay for the anniversary trip we planned ten years ago. It was a wonderful trip! At the cabin Lovin’ Inn we have found rest, relaxation, peace and a romantic reminder of a perfect wedding. Everything we were looking for. Thank you so much! 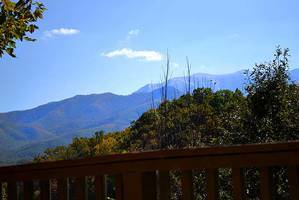 We chose Gatlinburg for our wedding because we had both visited before and loved the area. We looked at many chapels and cabins online. When we called several we got the best treatment from Honeymoon Hills. Everyone was so nice and helpful. The cabin we stayed in was the Lovin’ Inn. When we arrived we found it very clean and decorated very romantically. It was perfect for our honeymoon. Everyone was great from start to finish. We really enjoyed the Lumberjack Feud Dinner and Show that Honeymoon Hills set up for us. A good show for couples or the whole family. The Old Mill Restaurant had the best food! I would highly recommend Honeymoon Hills for anyone getting married young or old! Thank you for everything! Our favorite things in Gatlinburg are the shops and Ripley’s Aquarium. We ate at Shoney’s. We loved being in Gatlinburg. There were so many activities for us to do but not enough time! We came to Gatlinburg for our five year anniversary. When we first arrived in Gatlinburg, we walked around downtown and ate at Johnny Rockets. We walked around again, then went to find our beautiful cabin Lovin’ Inn. We loved every moment of it until it was time to go. We had BIG FUN and can’t wait to come back! Our trip to Lovin’ Inn cabin was for our wedding and honeymoon. We enjoyed the zip lining and Ripley’s Aquarium, Dollywood, Zipline and many restaurants. We loved the Italian food the best. We found the best pizza around. We took this trip for our 19th anniversary. We enjoyed Ripley’s Aquarium. The Dixie Stampede was great! For our first dinner we went to Greenbrier. The food was delicious. We would like to take our kids back in the summer! Thank you so much for everything! We had an amazing stay! 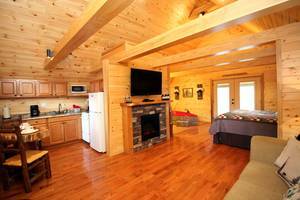 We loved our cabin and was amazed at how accommodating the staff was. Thank you for the hospitality. We hadn’t had a vacation in 11 years away from the children. We went to Gatlinburg to celebrate our 11th anniversary. We were so blessed to have had the chance to stay at your fabulous cabin Lovin’ Inn and we will be back! 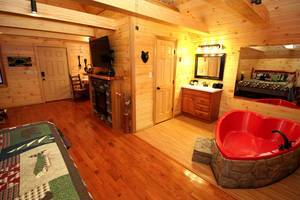 The Lovin’ Inn cabin was exactly as described online and was just the right size for our romantic anniversary weekend. The gorgeous mountain views with beautiful colors. It was wonderful to wake up to the views every morning. The location was very quiet and easy to find. Our trip to Cade’s Cove was such a beautiful ride. The colorful mountain side was so wonderful to see! Thank you for everything. We will return in the future! We enjoyed our stay so much! This was our 3rd visit to the same cabin and as always it was a peaceful and relaxing experience. The Christmas Lights in Gatlinburg and Pigeon Forge were beautiful. We came back each night to the jacuzzi and found a relaxing end to a great day! Thanks so much for everything! We had a great time visiting Gatlinburg. This trip was for our honeymoon. We went to Dixie Stampede, Cade’s Cove, did some shopping in town; hiking to Laurel Falls was also a fun adventure. The Lovin’ Inn cabin was just perfect! The cabin was just the right size and had everything we need. It was also so close to town. We can’t wait to come back! This trip was for our first wedding anniversary. We loved how secluded the Lovin’ Inn cabin was. The cabin was an ‘A+’, very accommodating to our needs. We will definitely recommend and return! The wedding pictures were wonderful. Every little detail was great! The Lovin’ Inn cabin was terrific. You all thought of everything we needed! Thank You! Everything was great! 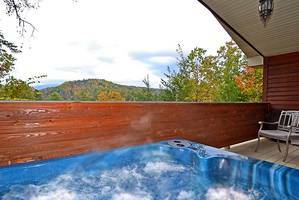 My favorite place was honestly the outdoor hot tub in our cabin. I also really like the Lumberjack Feud and Dinner Show. My favorite meal was at J.T. Hannah’s Kitchen. The chili fries were great and their burgers were huge! Thank you Honeymoon Hills for making this one of the best honeymoon I/we could have ever imagined!